According to a new study by South Africa’s Rand Merchant Bank (RMB) Kenya, Rwanda and Tanzania will be among Africa’s most attractive investment destinations in 2019. The RMB Investment Attractiveness index scrutinizes countries’ economic and operating environments to assess their potential to attract investment. Their report, 'Where to Invest in Africa 2019', is a key indicator of Africa’s overall business environment which has improved significantly in the past decade despite battling financing, corruption, inadequate infrastructure and weak governance in many countries. The regional trade in natural forest timber is increasing, reaching millions of dollars’ worth over the last 10 years. All of the countries in the East African region import timber and other forest products along with fittings and other machinery. Most of the countries also import processed forest products including paper, plywood & fibreboards, furniture, doors, fittings and joinery. China, India and the UAE have been the major suppliers of timber, wood related products and machinery, selling increasing volumes into the region. South Africa being an important player in this sector also supplies significant amounts of some of these products to countries in the region. Kenya has a large manufacturing base and is a strong economy in the region. The country has been experiencing a building boom for several years, which has led to a high domestic demand for wood products, especially timber. Kenya has an influential role in East Africa’s timber trade. Most of the hardwood timber from other countries in East Africa is imported to Kenya, with very little Kenyan wood exported. The main products imported into Kenya are timber, poles, charcoal and furniture. Tanzania placed third in the region, has seen significant overhaul of the business environment thanks to government tax breaks, development of special economic zones, investment in public infrastructure and growth in the services sector working together as incentives for foreign investors. Tanzania also posted a steep increase in projects supported by FDI. 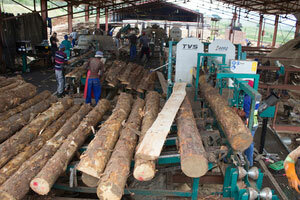 The wood based forest industry in Tanzania is dominated by sawmilling, furniture and other processed wood products. The number of registered mills increased from about 140 in 1998 to 367 in 2005 and has only registered a constant growth since. Tanzania’s domestic demand for hardwood timber is about 150 000 m3 per year (Anon., 2011b), and this accentuates the need to import hardwood timber. The value of imports has been increasing over the last eight years. The recent opening up of the telecoms, shipping, power generation and aviation sectors to foreign investment will also prove to be a further boost to investor interest. Expogroup is a full service exhibition organiser with over 21 years experience in International trade exhibitions. Our current portfolio includes 27 annual exhibitions from a diverse range of industries being held across the Middle East & Africa.